The Drexel golf team, featuring (from left) Freshman Yoseph Dance, senior Ben Hinge, sophomore Christopher Crawford, freshman Brian Fischer, and redshirt sophomore Andrew Feldman, finished seventh out of 16 teams at the Villanova Wildcat Invitational. Crawford, center, finished first overall in the competition. Since the beginning of autumn, the Philadelphia 76ers have won 21.3 percent of their games despite facing just one opponent each time they play. 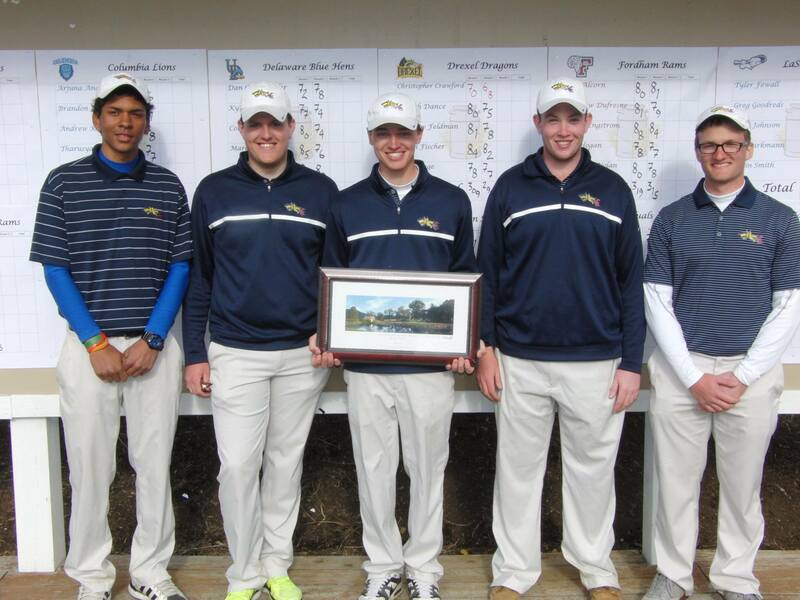 Since that same date, Drexel sophomore Chris Crawford has won 28.5 percent of the golf tournaments he’s competed in while facing upwards of 50 separate competitors each time out. Need a respite from the torturous basketball being played at the Wells Fargo Center? Look no further than Crawford, who sealed his second tournament victory of the season at the Villanova University Wildcat Invitational April 1. Last year’s Colonial Athletic Association Rookie of the Year and the leader of the Dragons’ golf team, the Bensalem, Pa., native is one of Drexel’s most promising young sports stars. But you wouldn’t know it upon first meeting him. When Crawford appeared on The Triangle Sports Podcast in February before the spring season began, he was quiet and noncommittal about his game. He doesn’t boast about his skill. He just happens to be really good at golf. This past Monday and Tuesday, Crawford and the Drexel men’s golf team played 54 holes in two days at the Wildcat Invitational, nearly fitting in an entire two rounds of golf on the first day. The way Crawford was hitting the ball Monday, he wouldn’t have minded if the tournament organizers decided to let the teams finish the whole thing that night. Crawford carded a 70 in the first round, the best in the 89-player field and the only participant to come in under the 71-stroke par at the White Manor Country Club. But, as those who know Crawford’s game will tell you, he was just warming up. He always makes his move the second time around. The sophomore proceeded to shoot on-par through the first 15 holes before tournament organizers called play off for the day because of darkness, the result of trying to fit two rounds in one day. Rather than letting the splitting of the rounds throw him off his game, however, Crawford came out firing Tuesday morning, putting away three straight birdies to finish his second round with a 68, tied for the best round in the entire tournament with the second round from the University of Delaware’s Fraser Graham. His blazing second round improved his second-round average score to 70.71, 3.56 strokes better than his first round average through seven tournaments this season. More than just improving his statistics, however, Crawford’s second round also put him a full five strokes ahead of the United States Military Academy’s Peter Kim entering the third and final round. Crawford carded a three-over 74 in the third round Tuesday, his worst round of the tournament by four strokes. But it was more than good enough to keep Kim at bay, and Crawford finished the tournament with a three-round total of 212, his second-lowest three-round total of the school year. His best? 210 at the Cornell University Invitational — his other tournament victory of the year. His massive three-birdie start to Tuesday aside, Crawford doesn’t beat you over the head with brilliant shots hole in and hole out, head coach Mike Dynda said. With the victory, Crawford boosted his average finish position this season to just past 15th. He has finished tied for fifth, 22nd, and now first in the three tournaments of the spring season, which began March 3 in North Carolina. Adding to his already superb week, Crawford was named CAA Golfer of the Week Thursday for the third time this season, including the second time this spring. In Crawford, Drexel has something not many schools get to experience — an athlete at the top of his game who’s dominating his league. His coach says he’s enjoying the ride. With just two more invitationals to play before the CAA Championships begin April 25, Crawford and the Dragons will look to keep the good times rolling. The team hits the links again April 6-7 at the Lafayette Invitational in Easton, Pa.